As frequently noted in earlier posts on this blog, the value of speed in broadband communications networks and digital communication devices, has never been questioned in public policy debates here in Korea, as it has in the U.S. Two items in the news this week suggest that South Korea will maintain its "lead in speed" for some time to come. 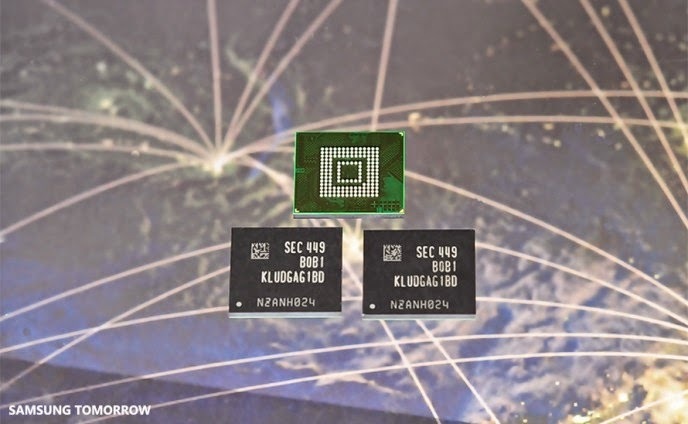 First, Samsung Electronics announced that it is mass producing the world's first 128 gigabyte ultra fast embedded memory for next generation smart phones. (click on the graphic to see a full-sized version) As noted in the Samsung press release,"For random writing of data to storage, the blazingly fast UFS embedded memory operates at 14,000 IOPS and is 28 times as fast as a conventional external memory card, making it capable of supporting seamless Ultra HD video playback and smooth multitasking functions at the same time, enabling a much improved mobile experience." Second, as reported in The Korea Joongang Daily, Korea's LTE networks are getting faster. As noted in the article,"Korean mobile carriers on Thursday introduced their upgraded LTE technologies, which ramp up the current 300Mbps networks to 600Mbps at the maximum ahead of the Mobile World Congress (MWC) that kicks off in Barcelona, Spain in March." Each mobile service provider is using different technology, but with the same result: increased speed. Korea's ICT-led development at a crossroads?